It’s a RPG series I’ve been making, using the RPG Maker XP engine, blending RPG elements, exploration and adult content, that mostly focused on Queen Opala, her evil sister Osira and their mother Farah, though the latest entry in the series is branching out …and most importantly, the games themselves will always be free, even if the actual production process clearly can’t be. 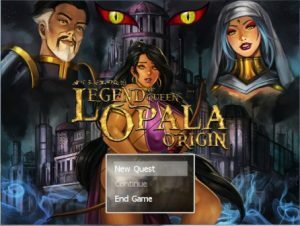 Currently, I’m making Legend of Queen Opala: Origin – Episode 2 with my mind set on a late 2016 deadline. Fix 418 – Entering the Homestead as of the previous beta could cause a black screen, this has been corrected. Fix 419 – It is now possible to trigger the CG Scene with Naz’Raala without taking the renegade route. Fix 420 – Naz’Raala has been added to the tent mechanic and is accessed through the dungeon. Fix 421 – Visiting Rivulet Hills too early made it impossible to leave the area, this has been corrected. Fix 422 – Fighting enemies during nighttime in the “alternative timeline” crashed the game, this is no longer the case. Fix 423 – Most taverns and a few other places have gotten a new booth mechanic, and the cathedral now have confession booths. Fix 424 – Gabrielle could appear twice at the same time during some Tavern Wench Challenges, this has been corrected. Fix 425 – Discovering Summer Cove at night made the screen get stuck in faded black, this should now be fixed. Fix 426 – Two Trading Card players at Castle Warrengard disappeared after Blackgard Stronghold, this has been corrected. Fix 427 – The Skalhalm arc is now finally completed. Fix 428 – Additional story has been added. Fix 429 – Bal’Rana’s Tavern Wench Challenge mini-games now has International Edition CG. Fix 430 – The Illusian Forest arc has been added and implimented to naturally flow along with the story. Fix 431 – Fighting the Legendary Monster of River Checkpoint at night would crash the game, this has been corrected. Fix 432 – Booths have been added to a lot of taverns/inn locations with a gloryhole mechanic. Fix 433 – The Tavern Wench mini-game had some small graphical bugs that has been corrected. Fix 434 – The emoticons for the protagonist has been replaced with a new set to better suit the battlepose. Fix 435 – The Encyclopedia has been updated to list all the latest illustrations/trading cards.